Amazon.com so thoroughly dominates the online retail world in the United States that no pure digital competitor would have a chance at knocking it off its throne. It might be possible for a well-funded niche retailer to nibble at the edges of the online giant by doing one thing really well, but the idea that anyone would attempt to directly compete seems silly. Amazon not only has the ability to offer the lowest prices (though it does not always use it). It also has a well-developed delivery network with warehouses dotting the country. Those regional fulfillment centers -- which were and continue to be a massive investment for the retailer -- allow the company to cut shipping costs. 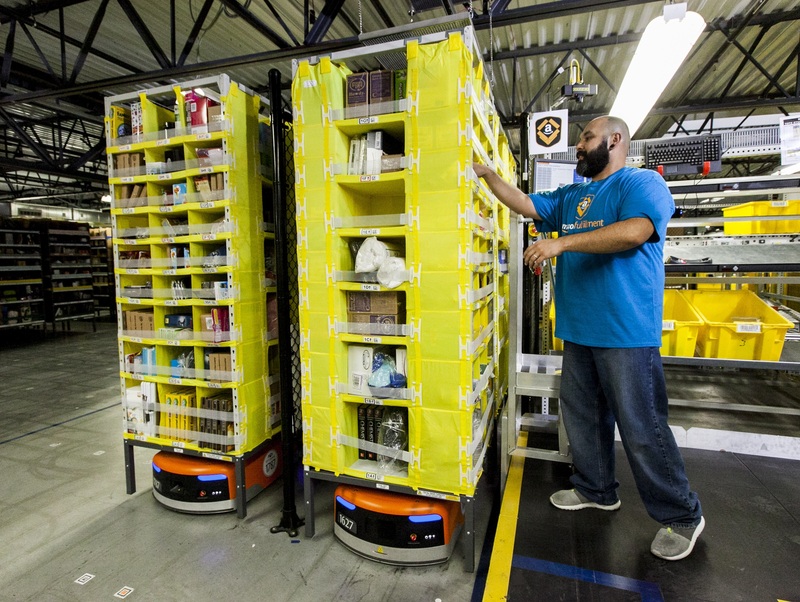 Add in the fact that Amazon owns its own robot company and has deployed non-human workers in its warehouses and the retailer has a host of advantages that would be very tough to duplicate. The online retailer has one last advantage that gives it an almost insurmountable edge over its competitors and any would be challengers -- its massive number of users with credit cards on file. It&apos;s not impossible to compete with Amazon --AppleorWal-Martcould in some areas -- but the digital leader has a combination of sustainable competitive advantages that make it very hard to compete with. Let&apos;s break them down and look at why it&apos;s the way each edge the company has built works together than keep competitors at bay more so than any one on its own. Pricing is a deterrentAmazon has achieved such a massive scale that it gets the best prices possible from its vendors. Wal-Mart gets the same thing as do a handful of other retailers in select areas, but the amount paid to manufacturers is not the only factor in setting prices. Physical retailers price their goods based on a higher cost structure than a pure digital store. Wal-Mart has actual stores and those stores cost more money than shipping warehouses. Of course, it&apos;s possible for physical retailers to charge less online but that can anger in-store customers. Amazon can operate on razor-thin margins and still make money on the transaction. Physical retailers can&apos;t do that and if they drop prices online they risk cannibalizing their own sales and driving margin down while having all the same overhead costs. Amazon has shipping downBecause it has no physical stores, Amazon has optimized its efficiency in the delivery business. This includes warehouses strategically dotted around the country and the aforementioned robots. The company also has highly advanced software that helps it set inventory levels and even begin packing orders based on predictive algorithms. Amazon also has progressive deals with the United States Postal Service andUPS that give it a shipping edge. It&apos;s possible that a competitor could make similar arrangements and the biggest retailers might match the company&apos;s warehouse network, but it&apos;s very difficult, if not impossible, for a competitor to match all of the shipping advantages Amazon has built itself over time. The credit card base is keyWhile Apple has a lot more credit cards on file for registered users than Amazon does, the company lacks everything else on this list. One of the biggest hurdles facing any competitor to the online king is getting people to register and turn over their credit card info. Even big physical retailers don&apos;t have that information and customers tend to be reticent to give it even if they trust the store when they can just buy the item on Amazon. Call it the advantage of malaise, but who wants to complete a registration when a perfectly viable site which already has your info sells pretty much everything at a fair, and often better, price? It&apos;s good to be bigWal-Mart and Apple could, in theory, make a run at competing with Amazon and both do in certain areas, but the online retailer has given itself a sustainable competitive advantage. Equaling the company&apos;s shipping prowess while matching its pricing, and maintaining a similar user base is a series of hurdles which should trip up competitors. It&apos;s not impossible to compete with Amazon in certain areas, but it&apos;s unlikely we will see a Pepsi to its Coke. Amazon has simply built up too much of a lead and invested too heavily in the online model for an frontal assault by even the biggest rivals to work. The article Amazon&apos;s Sustainable Competitive Advantage originally appeared on Fool.com. Daniel Kline owns shares of Apple. He orders from Amazon almost everyday and recently starting getting kitty litter from the retailer because it&apos;s heavy. The Motley Fool recommends Amazon.com, Apple, and United Parcel Service. The Motley Fool owns shares of Amazon.com and Apple. Try any of our Foolish newsletter services free for 30 days. We Fools may not all hold the same opinions, but we all believe that considering a diverse range of insights makes us better investors. The Motley Fool has a disclosure policy.